Assign any employee to any vehicle protected under our plan! Protection for long-range travel in the U.S., Canada and Mexico! Tailored plans for trucking or rental car companies, corporate fleets, service vehicles and more. Convenient mobile claim app with GPS locator. Protection that works when you need it. As an Encore Protection member, you will be protected by the most comprehensive roadside assistance program available today! Are Your Truck Drivers Prepared for a Roadside Emergency? Accidents and breakdowns can happen – anytime, anywhere. Whether your drivers are broken down on rural scenic roads or if they’re stuck in busy city intersections, they need 24/7, up-to-the-minute emergency commercial roadside assistance to get them back on the road so they can complete the job at hand. But with some commercial roadside assistance membership programs, your fleet vehicles might not get the coverage they need. For instance, some memberships limit you to only five miles of towing per claim or to only four claims a year! Encore Protection’s comprehensive commercial roadside assistance programs are designed to provide your company with affordable, pay-per-vehicle (not per individual! ), nationwide coverage – meaning you’ll pay less than most other fleet emergency roadside protection programs, for better services! With our program, your drivers can make up to one claim per vehicle per week. Also, we have customizable towing plans that allot 25-, 50-, and 100-mile coverage options from their breakdown location, allowing us to get you to a trusted service station, fully covered, no matter where your drivers break down. Encore Protection offers above-and-beyond consumer and commercial roadside service for cars, motorcycles, trucks – and even entire commercial fleets. Whether you’re a parent hoping to choose the best coverage as your child leaves for college, or you’re a fleet manager hoping to cut costs for your company, Encore is the clear choice. Fleet managers and small business owners should check out our plans for commercial vehicle services. Individuals, families and households can read about our plans for consumers. Consumers who’d like to bypass the standard three-day waiting period can find details on our immediate coverage. 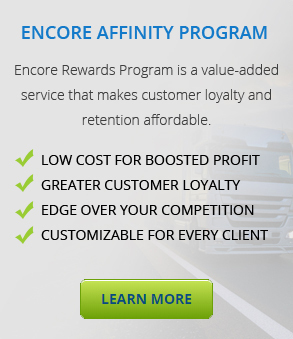 Learn about our membership perks and find out what makes Encore different from other roadside assistance companies. Ready to enroll? Just fill out our short online application!